To delay falling into a fiscal and financial sinkhole. “Let’s drop the pretense. The Toronto housing market and the many cities surrounding it are in a housing bubble,” Bank of Montreal (BMO) Chief Economist Doug Porter told clients in a note last week. Many have called it “housing bubble” for a while, but now it’s official, according to BMO. In January, the benchmark price and the average price were both up 22% year-over-year, with the average price of detached homes up 26%, of semi-detached homes 28%, of townhouses 27%, and of condos 15%. Double-digit price increases have become the rule in recent years. But this jump was “the fastest increase since the late 1980s – a period pretty much everyone can agree was a true bubble – and a cool 21 percentage points faster than inflation and/or wage growth,” Porter explained in his note, cited by BNN. The often-cited mantra that Toronto’s real estate market is being driven largely by a lack of supply is wearing thin, he argues. Housing starts in Toronto and Vancouver recently hit an all-time high of 70,000 units per year and overall Canadian starts are above demographic demand at 200,000 units in the past year, according to BMO. “Toronto and any city that is remotely within commuting distance are overheating, and perhaps dangerously so,” he said. But don’t expect the city of Toronto to do anything other than inflate the bubble further. It has to – unless it wants to fall into a fiscal and financial sinkhole. This became apparent last week, when the city councilors approved Toronto’s operating and capital budgets. What a mess! The tax-supported operating budget is now expected to grow by 4.4% in 2017, to C$10.5 billion. 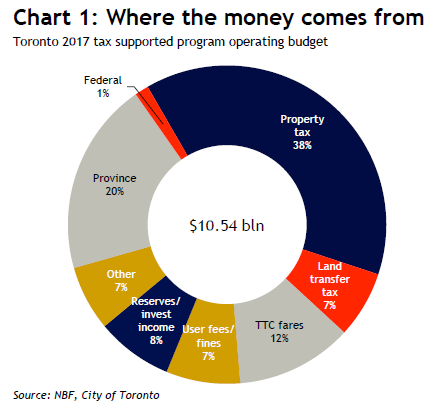 So more taxes must be extracted from the hapless folks in Toronto. Among sundry fees, taxes, and levies, the councilors approved a 3.29% increase in the residential property tax and raised the municipal land transfer tax. Under the new budget, property taxes would provide 38% of the revenues, and the land transfer tax 7%, for a total of 45% of the C$10.5 billion in taxes, or C$4.7 billion. Of note, land transfer tax revenue has skyrocketed in recent years, moving from a budgeted $165 million in 2009 to an estimated $716 million in 2017—a greater than 4-fold increase over eight years – driven in part by rising property values and a move to harmonize the city’s tax rate with that of the province. Despite successfully addressing ~$750 million of net budgetary pressures/new investments in 2017, there are still “significant future annual budget gaps” to be filled going forward, including an estimated $371 million hole in 2018. Clearly, from the city’s perspective, alternative revenue tools are needed to address large unfunded capital needs. As for bond supply, the budget outlines $840 million of new tax supported debt issuance in 2017, largely in line with 2016. Issuance is seen rising to $900-990 million/year in 2018 and 2019. So imagine what might happen to Toronto’s tax revenues, budget, debt issuance, and credit ratings once property prices head south. Toronto is just an a example. There are many jurisdictions in the US that face similar budget problems, and the only thing that keeps them from falling deeper into a financial and fiscal sinkhole is the rich tax revenue that the local property bubble extracts from the economy. Homeowners and investors might grumble, but they usually put up with it, mollified by soaring property prices. So this system works until suddenly, it doesn’t. That moment occurs after the house price bubble begins to deflate. Politicians (and central bankers, too) will try to do whatever it takes to kick that inevitable moment further down the road, on the theory that, hopefully, by then, they will have moved on and out of harm’s way. The best part of capitalism is making money doing nothing. I sit on my behind and my house just goes up and up in value, perhaps I should buy an investment property. Making money doing nothing, you can’t beat it. Let’s look at your logic. You made “money doing nothing” as your house doubled in value in five years. Now let’s say – Your property taxes went from $5,000 to $10,000 too. Five year later housing prices crash back to near pre crash levels. And will be paying higher property taxes forever now as the city is addicted to the money. Children may starve! And please, no false tales of selling at the top. Some areas have caps for those rates so that this is not the case, for example 3% cap rate for each year base on your purchased value not market value of the current year. Don’t forget that you can go to your local Value Adjustment Board and dispute your assessment. Realistically, most don’t do this or even know but it’s a powerful tool and you don’t need to hire an attorney, hire your local property appraiser. Unfortunately, appeals don’t work very well. I went through the process because I bought my house for less than it was assessed. So I thought I have clear case. And although I was granted 50 dollar reduction in my property tax, which amounted for almost nothing, I noticed after a while that my yearly tax amount started growing faster than my neighbour’s. So, no I don’t think you can win this game with the tax man..
Marry that with Christianity and you also go to heaven at the end!!! Of course there’s a little bit of work of writing down your religion when someone asks for it, but really, the payoff is unimaginable. Financialization, central banking and financial repression are most definitely not capitalism. There can’t be a crash without you people. Go ahead, buy. See you at the auction block. Do they publish any data on who is buying these houses? I wonder if it’s not just speculators, but capital flight from China looking to buy a property at any cost? Nobody. There isn’t a buyer at that price. I can ask $50k for my 10 year old Chevy pickup but where is the buyer at that price? So it is with all depreciating assets like houses. The only data available are those from surveys among a sample of Toronto real estate agents (3500 out of 47000): there are no “official data”. These data say foreign buyers accounted for 4.9% of all sales in 2016 but… “domestic real estate investors” account for 25% of the sales, a pretty hefty chunk. However the survey stops there: it doesn’t go in the details of who owns these investment firms or who puts money into it. There are also suspicions these real estate agents are willingly downplaying the number of foreign buyers (the survey is not legally binding: one could even answer questions at random) to avoid a repetition of the Vancouver fiasco, meaning such a public outcry against “foreign speculators” that politicians have to do something, anything, about it. The Federal Government seems to have finally realized something strange may be going on in some housing markets and gave half a million loonies (barely enough to buy a bag of peanuts ;-) ) to Statistics Canda to study the Vancouver and Toronto housing markets. In typical bureaucratic fashion, no deadline has been set for the release of this sweeping study. Serial flippers buy them. People that were lucky enough to get in and out and make a lot of money in the process. There is no data or the data is likely held by those with a lot to lose if made officially known. The money is almost 100 percent Chinese. 50 percent from local Chinese and 50 percent from Chinese abroad. The Chinese will bid a single house past the one trillion dollar mark if the bubble doesn’t burst first. It’s nice to see this under the microscope. As a Torontonian, there’s really no future here. The youth are leaving because, despite an abundance of work opportunities, the transit infrastructure has been overcapacity for the past decade and the politicians are essentially playing fiddle while the city smoulders. As for real estate, there’s all this hype that it’s foreign buyers from China specifically, but it’s completely overblown. Chinese buyers affect the market in the sense that they are looking to purchase in the areas that have *always* been largely Chinese, demographically. But they aren’t buying condos downtown to jump in on the temporary rentals racket (AirBNB). No, that’s mostly local fools who have no financial sense but fancy themselves investors because they have qualified for a mortgage on some form of shelter. In fact, if you search for condos for sale anywhere within 300km of the city, you are almost guaranteed to find the phrase “great investment property!” in the ad. It’s the con du-jour, except ridiculously loose standards for real estate agents have allowed the industry to turn the housing situation into an epic pump n dump scheme and it’s Joe Everyman who is going to be left holding the bag. If it was this easy to create prosperity with cheap and easy money – it would have been done through out history. It has been tried many times. Always ending in disaster. Disaster for whom? If it’s been done so many times, some people must have benefited, otherwise why do it so many times? Just make sure that you are part of the group that benefits. Incorrect and it’s never “been done”. This is an unprecedented toxic debt mania that will end in pain for those who were foolish enough to overpay 300% for a rapidly depreciating assets. Well said NotSoSure. This is a formula for wealth for those with immaculate timing and it shows. Nothing new here either. This is hardly news today or in any other generation. And it is always best to have enough money to move the market in the direction you want it to go. That way you can decide when the bottom is, short the market, and sell at the top. Unfortunately, most of us aren’t in that position. There’s an old phrase “the average person always dies broke”. You just sit back and watch what the blithering idiots do and do the opposite. I’m short Home capital and added Genworth Canada. I’m short both and with the stock market more overvalued than any time in history the odds certainly favour me. Don’t forget over the period there has been a large currency decline vs. US$. So while my house (about 1 hour outside Toronto) has risen by 50% in 10 years, in US$ it is up only 15% (not so great if I want to retire outside Canada – now unlikely). A lot of demand is driven by immigration – about 1% of the population a year – or about 1,000 new people a DAY needing housing. And right now there is NO supply where I live. Anything half decent goes in 10 minutes. – check realtor.ca and compare it to zillow – where US cities have a fair bit of supply. The huge issue will be property taxes going forward. Mine are now about 1% of the value of my house, and have been going up at about the same rate as my house. Once this price rise stops and property taxes by virtue of inflation continue to rise, that is when the SHTF. Same thing for renovations (huge business). Easy to do when prices are rising, not so much if they are falling or flat. When this does reverse it will not be pretty and for that reason (which any sentient being should be able to see) they will do all they can do to keep it blowing bigger. I ran into a retired co-worker of mine last year. He retired young and does not have much of a pension to rely upon. He lives 6 months of the year on Cortes Island (BC), and 6 months in Mexico. He seemed pretty fit and happy, and sported a younger girlfriend on his arm. :-) He said, “You can live pretty cheap in Mexico and they like Canadians”. I rented a studio in Puerto vallarta for 245 cad includes utilities per month.Food cheap,alchol cheap ,transportation.$800 a month for a single guy a month easy!! This is an importent observation. The decline in CND currency that started in 2014 makes Toronto Real estate much more affordable to international buyers. And there are a lot of immigrants to Toronto every year. Canada is a safe place and Toronto is arguable the most sophisticated city in the country. Hence the popularity. I imagine some people weigh living in Toronto to Chicago or New York, North America’s other international cities. Compared to those locations Toronto is probably better value. Not everyone can afford New York and not everyone can afford Toronto. No, the vast majority of immigrants do not have $1M for a house. Immigrants struggle to immigrate to the rich country of Canada for a better life for their families. They are not rich themselves. This is a false story I’m tired of hearing. Critical thinking skills everyone! Yes, there are those immigrants that struggle mightily. But there are also plenty of wealthy foreigners, particularly the Chinese, who buy homes, often not as immigrants but as non-resident investors. For them, this is an investment and a way of capital preservation – not necessarily a “home.” It also gives them a foothold in another country where they can breathe the air and where property rights are solid, in case something untoward happens to them at home. That impacts the housing market in big ways. This is going on in a number of cities. BC’s transfer tax was a reaction to that, and look what it did to the Vancouver housing market – now those Chinese investors are going elsewhere, including Seattle and Toronto. I do agree there is capital flight from China. However it is not enough to propel the housing markets into the atmosphere. It is one of many factors. We do not have 100,000 Chinese immigrants a year. We do have 100,000 unoccupied properties in Toronto, another 60,000 in Vancouver. Like I said above. Critical thinking skills please. The numbers do not add up. The Chinese are being used as a scapegoat. I may have to eat my words on this one. I have been trying for months to rent an apartment in Toronto, as I have sold my gta properties. Every single landlord has been foreign Chinese. I have not been able to secure an apartment yet, somehow I am always outbid or just down right declined. Absolutely no reason to decline, great income well into 6 digits, >800 credit score. Today was a repeat of my past dozen applications. I absolutely hate to say this, but it has been said straight to me by one landlord doing a private rental in harbour square… Chinese only want to deal with Chinese. So no, she would not rent to me. What is going on in Toronto?! And now there are more rentals on the market than properties for sale. Check it out… unreal. All 100,000 vacant Toronto properties do not have to be purchased by rich Chinese to inflate a real estate market. Wolf undoubtedly has better numbers, but when a small %age (<5%) of those vacant properties suddenly sell at a premium, it sends a strong price signal throughout the market, and all prices increase. On day 1 you think your house is worth $100,000 and the house next-door is worth $95,000; on day 2, the house next-door sells for $110,000; on day 3, when you find out about this, you now think your house is worth at least $120,000! The only demand is from the Chinese and now the (non-Chinese) Millennials and many of the Generation X’ers (non-Chinese) have done a “Chinky see, Chiny do” and soon will learn about value investing and what inevitably always happens to the Chinese just like back home in China. Ponzi’s don’t end well for 90 to 95 percent of the participants. I have lived in Toronto for over 30 years now, and from what I see, it is immigration that has spurred the housing growth. Go into any grocery, and the stands that house the free publications will indicte the predominant nationality of the area. These are national groceries, and they dedicate multiple aisles to these nationalities…I am not against this…I just point it out…in fact I am all for immigration…both my parents immigrated here from Italy. That said, the house prices far exceed any semblance of wage growth…as far as areas outside Toronto…prices are going up as those who sell in Toronto buy there and pocket the difference. You also have retirees, that are selling and move into the Golden Horseshoe (50 – 100) miles to the south…and that is giving rise to the house prices in that region. I have to laugh…Toronto is approximately 100 miles from Buffalo New York, and even with the difference in the exchange, I would bet that the price of a house in Buffalo is a fraction of the price to that in Toronto. The population of Buffalo peaked in 1950. If you had read further into the source of your data, you would have seen where they say the reason for the 1950 peak in population is due to suburbanization, where those that can do it move to the suburbs. In fact, the metro area population is now over 1.1million. The reason for lower property values in Buffalo is relatively lower wages and incredibly high property taxes. That combination is automatic for lower property values. Think about it for just a moment. The Bills (AFL/NFL) were born in 1960, and the Sabres (NHL) were born in 1970. Generally, major league sports aren’t fond of moving into dying cities. Tone, you have NO idea what it is like to live in China. For the past 30 years, the chinese made goods and sold them to west in exchange for $. Within China, it is simply smog, crowd, endless competition and bad attitude toward each individuals and freedom suppression. They just want to go to a place where there is fresh air, less crowd, better attitude toward each individual, less corruption, more freedom. They have their $ and US has tough immigrations. Canada opens their doors, and want to transfer those Chinese accumulated wealth into the hands of their citizen and government. Bubble is always about wealth transfer, and everybody knows it. The thing is, Chinese people is okay with that transfer. I’ve seen a huge growth in the Chinese diaspora around the world. I travel frequently and every major city I go to has a large and fairly new Chinese population. That being said, most of the Chinese folks I meet are very bright, kind and generous people. you have to meet chinese people in china waiting in line for bus to get a feeling of how crowded and rude the situation is. It is not the people, it is the people in that environment. When they land in another environment, their behavior change. Calgary and Vancouver are now in serious trouble, the dream has ended, but of course people in Toronto think it could never happen there. Buying houses like it’s 1929. You folks might appreciate this timely article as a follow-up to Wolf’s post. Financial bubbles must be squashed early, otherwise ‘bubble investments’ are used as collateral for other bubble investments and the whole thing spirals out of control. The capital the author speaks of is as real as pixie dust, but deadly for ‘real transactions’. money will remain cheap for the the forseeable fututre. But -There will be a ‘final crash’ but that may be a decade or more away. I see no ‘sane’ parties operating either US or Canadian markets. That is a good article and I think it touches a major point : there is lots of money looking for a return better than the 0% interest rate environment we have been having for the last 10 years. Imagine being blessed or cursed with having 10million on your account, your immediate concerns (once you satisfy your immediate petty materialistic desires) will be how to preserve it and how to get some return from it. For any reasonable conservative investor. real estate will satisfy those two concerns better than most other opportunities available in the last 10 years. This does not answer the question as to where is this huge capital is coming from. Is it really capital or just bank credit ? With money being backed by nothing but the faith in central bankers and their recent propensity to create trillions at will, what is capital anyway? I think most individuals with money see through this and see real estate as gold, a tangible asset that can produce some rental income. On another note, I recently read that chinese banks are suing in Canadian courts chinese nationals who borrowed money in china to buy real estate in Vancouver and subsequently defaulted on their loans in China. It wont surprise me that this type of fraud is sp prevalent that a crash will eventually come, and there is no such thing as too much capital, rather an old fashioned bubble in the making. I was watching a documentary about 2008 and its effects on China. Demand for Chinese goods collapsed and China is ultra-capitalist and many firms just shut down over-night, their workers found the doors locked the next day. Outstanding wages were unpaid. The owners often just shut the doors on their factories, disposed of all the documentation and just disappeared into the night. Interesting comment Momento. I would say the capital is coming from wealth disparity. If two people make enough money to live a normal life, they spend on necessities and have little savings. If the earnings of both persons is allocated to one person (via a crony system), one person’s savings will be created out of nowhere, courtesy of the other’s misery. The capital is coming from fractional reserve banking. Banks create money out of thin air every time they make a loan. Then they borrow the necessary reserve in the inter-bank market. The system works fine when it used to finance new factories and growth (adds money to purchase new products). Fails miserably when it is used to finance ever growing asset prices. Worked that way under the gold standard also. Often even worse due to the lack of oversight. However, all of this will fail when the median mortgage payment surpasses the median weekly household paycheck less food, water and utilities. Fraudulent mortgages. Look it up. At least 1 in 5. Nicknamed ‘Brampton Loans’. Seriously, not a joke. The phrase “the basements of Brampton” is already world famous. Check Edmonton, Alberta Canada residential real estate from 2007 to 2017. Most condos and townhouses built in 2007 are still down 50 plus percent over the last ten years as of today. Taking inflation into account that would equate to around 60 percent as of today. We sort of know QE hasn’t entered the real economy as can be seen from low inflation rates around the world. It sits on bank balance sheets to be used for financial speculation, the QE can then be leveraged up by the financial sector. The cure is the problem. 1% increase in interest rates will equate to 10%-30% drops in real estate values. do you really believe they will increase rates without an agenda next time? Rate increases equate to increased foreclosures, bankruptcies, and of course back door bailouts and price control schemes. how does the street conduct backdoor bailouts? apart from the balance sheet increases – wolf has written about the rent-to-own hedge funds. between hedge funds buying defunct properties and back-door bailouts on bad loans- there is an infinite price floor (price control) in place. the creeps are only interested in the big metropolitan areas (for now). am sure as their appetite grows these parasites will spread about the rest of the world and eat the rest of whatever is left. oh well, another day in the deteriorating society. lets see what BS is thrown tomorrow. What are these “parasites” going to do when they own everything and there’s nothing left to steal? That’s what I’d like to know Turn on each other I imagine which should be fun Popcorn anyone? Summary of the state of capital flight out of China: Chinese with more than two Yuan to rub together want out of China, if they can fake an invoice or SMURF the money out they do it, then park the money in housing worldwide. The ChiComs have been playing whack-a-smurf for years now, but now they have hit the psychological $3T in reserves. Oops. Rickards says “$1T is illiquid (in CIC). $1T is needed to bailout banks. So, only $900B left to support yuan. China’s broke by December ”. Hence it is imperative for China to defend their reserves. The same Kyle Bass that’s been consistently wrong on Japan? That Kyle Bass? Well that does bring up the concept of Right and Early is the same thing as wrong. As for Japan, the “shikata ga nai” is strong with them. 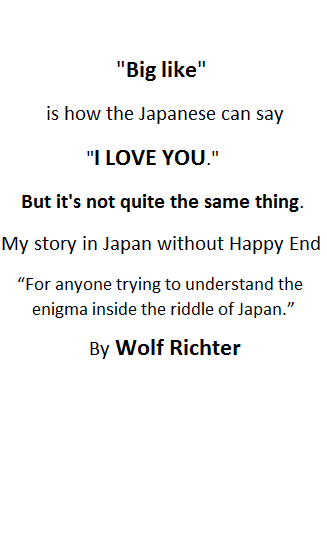 Mr. Wolf can probably explain if this assertion is correct. Regarding the link – Japan was not part of this discussion; China was discussed at length. I found it interesting. Perhaps it will not be to your taste as it is still early. to get an updated data. US banks don’t want to provide dollars credit to foreign banks. almost half. That’s in Trillions. Some European banks, like DB, were destroyed . real economy. Some financial assets are still rising, in the stock markets, in RE, but real income wage growth is crawling. close shop, or move (which is the almost the same). If you lost your job in silicon valley, or in the oil industry, you have to move. I live in Toronto and house affordability is an issue. However there are by some estimates 100,000 people coming to the city every year, this squeezes supply. With a lake to the south and a green belt to the north there is not much room for sprawl. There are a lot of infill project across the city, one big lot separated for 2-3 town houses. There are also a lot of expensive renovations where the house size is double, I suggest this is in part due to the high land transfer tax, people choose to stay put and upgrade their current abode. Bottom line pump the system with cheap money prevent people for moving and you get predictable results, assist appreciation. Finally unlike in he US mortgage interest in not tax deductible however capital gains on primary residence are not taxed. It is a unique set of circumstances that drive Toronto house prices. I doubt that Toronto bureaucrats were smart enough to deliberately create a housing bubble. So what happened? 1. A more generous immigration policy in Canada vs. the US. 2. Toronto is a relatively safe city, certainly when compared to Detroit or Chicago. But immigration from the Caribbean area has been a negative when it comes to public safety. 3. Quebec’s French language laws and regulations passed starting in the mid 1970’s, drove large numbers of Anglos to Toronto, along with the headquarters (and jobs) of two of Canada’s five largest banks. Three were alreqady there. Montreal became something of a backwater and lost its position as Canada’s largest city. 4. Toronto became the gay mecca of Canada and old immigrant neighborhoods became popular with non-immigrants. San Francisco was undergoing a similar demographic change. 5. Toronto is the capital of the Province of Ontario and has a disproportionate share of provincial government jobs. 6. Toronto became very popular with Chinese immigrants at a time when the Federal government was running a visa for sale policy in an effort to attract rich immigrants. Plus once the bubble mentality starts, it is self-reinforcing. All of those things kick of housing price increases. As it continues people want in to make money, which causes prices to go up even more. Rinse, repeat, eventually crash. 90% of the immigrants that you are talking about don’t have 2 nickles to rub against each other when they arrive. It takes most of them 10 years to learn the language, and start having meaningful income. That’s apparent from how low rents are in Toronto, or your Mecca, Vancouver. All these arguments that immigrants are buying up assets are just house wives tales. The only type of people who would pay such high prices for a shack in Canada a.k.a. North Pole are crooks who are afraid their money in their native country will be confiscated by the government or those who borrow money in their native country and have no plan to give it back. I don’t see it beyond real estate related criminal organization to just keep buying houses from each other on higher and higher prices to pump up the price of the houses. There are so many crooks that do anything. Look at the rental market in Toronto and Vancouver; if as you say 100,000 new people were coming to Toronto per year, the rent would have gone through the roof. You can find good apartments for $CAD 800. Do you know how low that is compared to hot spots in US? Ottawa is the capital of the province of Ontario. I live in an upscale neighborhood ocean-side. Single family homes. Nice properties. The Real Estate Agent across from me has been home for the last 3 weeks. Based on that alone I say we’ve reached the top and are falling. Digging in to my neighborhood, some homes are being built from last year’s contracts but I see some empty lots still unsold. For Sale signs have been taken off certain homes that are still for sale. People who can, rent their home now. I’ve been here for a long time and saw the same exact pattern in 2008. Was not aware that Toronto had an ocean. I probably can’t see it because Lake Ontario is in the way. same crumbling infrastructure, same horrible schools, same gangs crawling around the streets, YET – home prices and taxes up 300%.